Q: How long have you been with Bavarian Inn Lodge? 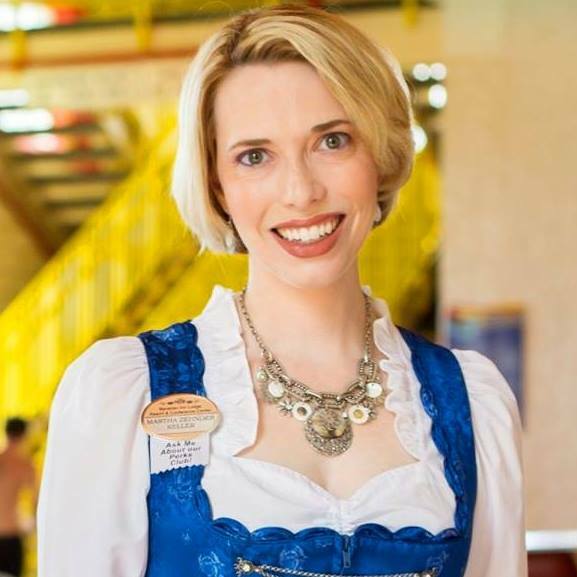 A: Being 4th generation in the family business… I have been with the Bavarian Inn corporation literally my entire life. A: I became a Chamber Ambassador in December 2013. Time sure does fly when you’re having fun! A: My favorite part about being an ambassador is meeting all the different people in our area. If I haven’t met you yet, please stop me at an event to say Hello. I’d love to talk with you. A: I’m one of the few people born & raised in Frankenmuth… and very proud of this. I attended Michigan State University, worked in Denver, CO for a bit and spent 9 years working in Chicago. In 2013 I came back to Michigan and participated for a few months working/living in Gunzenhausen, Germany as part of a Sister City Work Exchange before returning to our family business. I have a wonderful family and in June 2017 I married a wonderful man, John Kaczynski. A: Working at the Bavarian Inn Restaurant in the kitchen with my grandmother, Dorothy Zehnder. “If you can lean… you can clean”. I did a lot of cleaning, folding napkins, filling jam jars, and of course trimming chicken when I first started working there around age 11-12. A: My “to do” list. I believe I think the most about what I did during the day and need to do for tomorrow when it’s time for bed. That’s why I keep a pad and pen on the nightstand. A: Professionally, at the age of 30 being the Director of Convention Services and on the Executive Committee of a 1,200 guest room & 120,000 sq. ft. banquet space property in downtown Chicago. A: I’m not one for “stuff”. I’m more of a making memories type of girl. However, I would currently say my wedding ring. When looking at it, I think of the love of my life (my husband John if curious) and those people that celebrated our wedding with us. Makes me smile every time. A: FRANKENMUTH! Where else would you want to travel?!? And enjoying that Bavarian Inn chicken.